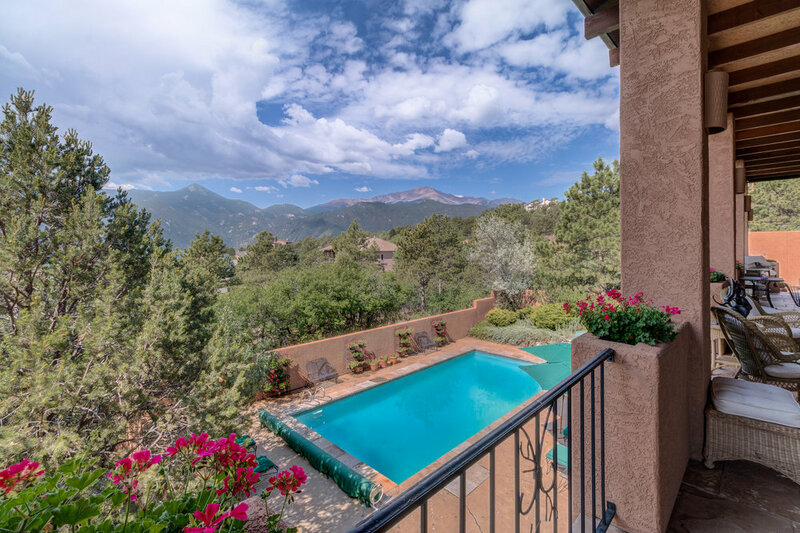 Tucked away on 2.5 secluded acres in the prestigious gated community of Cedar Heights, this custom Italian Villa offers a magnificent setting with 4,725 square feet of patio space, a swimming pool and breathtaking views of the mountains, Pikes Peak and the city lights. 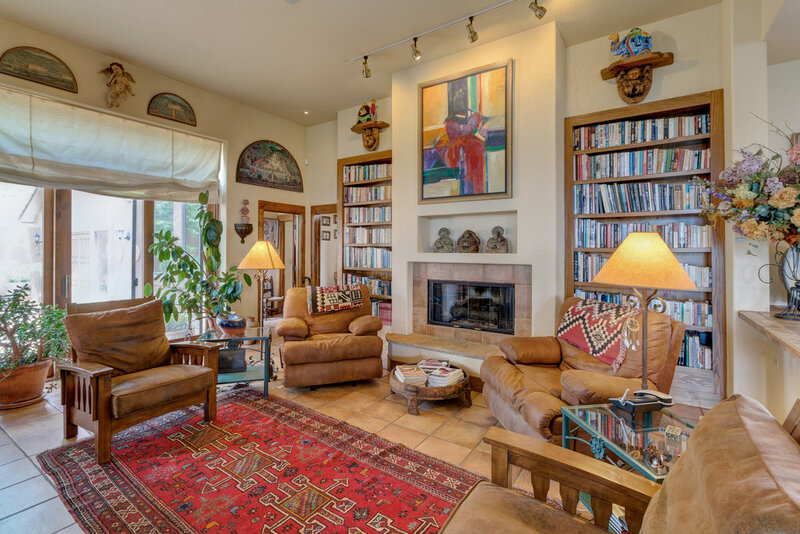 Built in 1994, the home has an amazing one-of-a kind floor plan reflecting the owners’ 24 years of living in Italy. Offering amazing details, this architecturally correct masterpiece boasts not only inspiring views but also spacious main level living with a magnificent great room as the home’s crown jewel. · A meandering sidewalk with inlaid stones for interest leads to the massive wooden front door. · Premier outdoor living areas include a back verandah, a walled side courtyard and a lower level patio that surrounds the pool. The covered back verandah has a beamed ceiling, stamped concrete “tiled” floors, a sun awning and custom wrought iron rails interspersed with built-in planters. The side courtyard has a charming wood door that opens to the front driveway area, a stamped concrete floor, a black rock “sculpture” and a built-in grill and pizza oven. Designed for entertaining, the courtyard has a set of rustic French doors that open the 3-car garage that has served as a dance floor on more than one occasion. 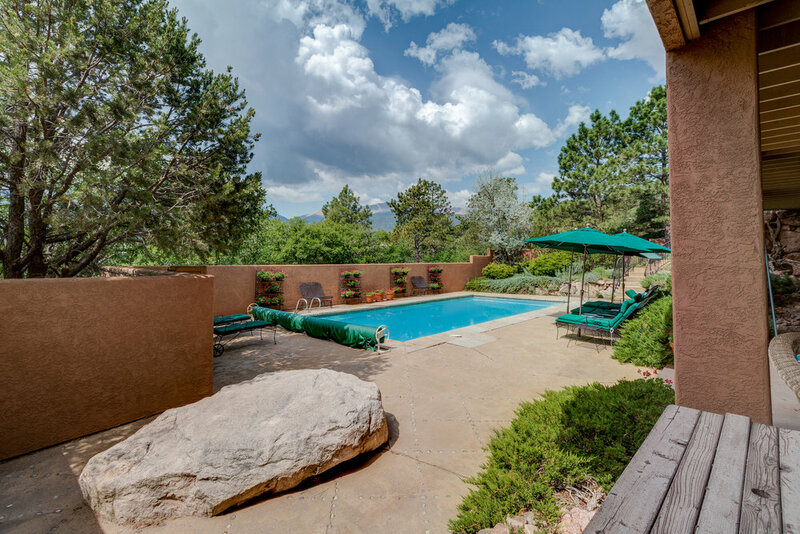 The lower patio has a stucco privacy wall and surrounds the fabulous 33’ X 16’ heated pool. 3-car garage with new insulated garage doors and epoxy floor. Two 2 furnaces with humidifiers, Central air, Constant recirculation hot water system with a back-up hot water heater, pool heater with filtration system. Xeriscape 2.5 Acre lot with a 4 zone sprinkler system for trees & shrubs. The impressive carved front door opens to a lovely entry hall with tiled floor and a coat closet. In turn, the entry hall opens to the magnicient great room. The great room, which has two distinct sitting areas, enjoys a 14’ beamed ceilings, 9” wide-plank pine floors and a wall of glass that frames the breathtaking view. In the center of this glass wall, there is a big glass slider that opens to the marvelous back deck. The main and more formal sitting area features a Colorado marble fireplace with gas logs. Notably, each stone that was used in the fireplace was hand-picked by the owner. The more casual sitting area has a wall of built-ins for books and/or display and includes speaker cabinets for the sound system. The great room opens to the dining room where two massive pine columns announce the room’s entrance. The dining room has a coffered ceiling with artisan wrought-iron chandelier and pine floors. At each end of the dining room there are built-ins: a buffet and a wet bar with ice maker and wine fridge. 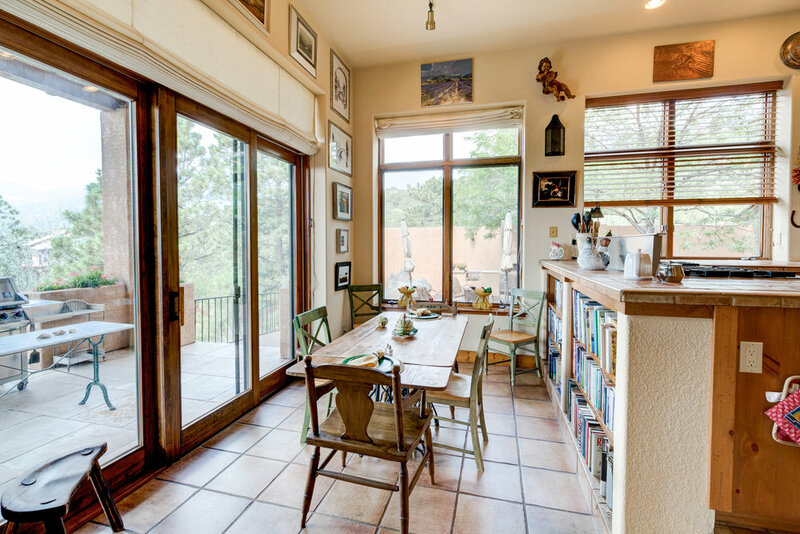 On the other side of the wet bar, there is a cozy library that features tiled floors, a gas fireplace flanked by bookcases and a big glass slider that accesses the side courtyard. A hallway off the library leads to a tiled half bath, an ample laundry room and a generous pantry. The hallway also accesses the garage. Next, there is the gourmet kitchen. Interestingly, the kitchen was purposely raised by two steps up. Why? The owner loves to cook and entertain and by raising the kitchen you can’t see into it from the other rooms! The kitchen has custom pine cabinets, a curved countertop mirrored by the ceiling, tiled floors and a butcher block center island. The kitchen appliances include a gas cooktop, a refrigerator/ freezer, microwave, dishwasher and a microwave. Next to the kitchen, there is a casual dining area with tiled floors and a big glass slider that opens to the back verandah. Privately located to left of the entrance hall, the master suite awaits. 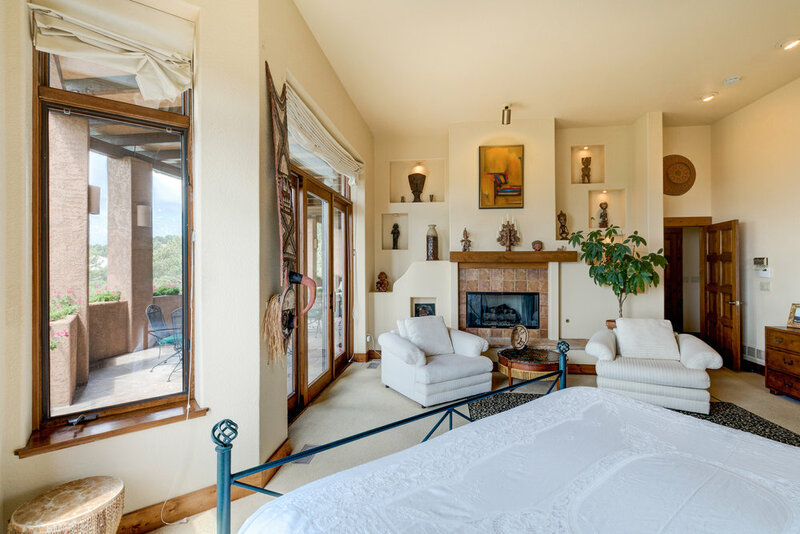 The master bedroom enjoys a triple glass slider with fantastic views and a gas fireplace. Designed to maximize the views, the master bath has mirrored walls that frame the views beyond. Master bathroom amenities include dual vanities, a tiled shower, jetted tub, “his” and “her” medicine cabinets and a linen closet. Off the bathroom, there are “his” and “her” walk-in closets. There are two guest suites on this level, both with private tiled bathrooms. One of these bathrooms also services the rec room area. Lastly, there is a huge utility/storage room. The storage room area is all but finished… it has central air, heat, windows and even a big glass slider to the pool area.